Washington, D.C., is administratively divided into four geographical quadrants of unequal size, each delineated by their ordinal directions from the medallion located in the Crypt under the Rotunda of the Capitol. Street and number addressing, centered on the Capitol, radiates out into each of the quadrants, producing a number of intersections of identically named cross-streets in each quadrant. [clarification needed] Originally, the District of Columbia was a near-perfect square. However, even then the Capitol was never located at the geographic center of the territory (the geographic center was located near the present-day intersection of 17th Street, NW and Constitution Ave.). As a result, the quadrants are of greatly varying size. Northwest is quite large, encompassing over a third of the city's geographical area, while Southwest is little more than a neighborhood and military base. The boundaries of the quadrants are not straight lines radiating from the medallion, but follow the paths of the boundary streets (which in some cases curve around topographical features): North Capitol Street, South Capitol Street, and East Capitol Street. The National Mall spans the entire boundary west of the medallion. "Northwest" (also written as NW or N.W.) is located north of the National Mall and west of North Capitol Street. It is the largest of the four quadrants of the city, containing more than 42% of the entire city, and it includes the central business district, the Federal Triangle, The Smithsonian National Zoo, and the museums along the northern side of the National Mall, as well as such prestigious neighborhoods as Foggy Bottom, West End, Columbia Heights, Petworth, Dupont Circle, Logan Circle, LeDroit Park, Georgetown, Adams Morgan, Embassy Row, Glover Park, Tenleytown, Piney Branch, Emergy, Shepherd Park, Crestwood, Bloomingdale, and Friendship Heights. The very large Rock Creek Park divides the northwest quadrant in two. "Northeast" (NE or N.E.) is located north of East Capitol Street and east of North Capitol Street. Northeast neighborhoods include Brentwood, Brookland, Ivy City, Marshall Heights, NoMa, Pleasant Hill, Stanton Park, Trinidad, Michigan Park, Riggs Park, Fort Totten, Fort Lincoln, Edgewood, and Woodridge, as well as much of Capitol Hill. Notable landmarks include the Supreme Court, Union Station, Catholic University of America, Trinity University, National Shrine of the Immaculate Conception, Franciscan Monastery, Providence Hospital, Gallaudet University, the National Arboretum, Kenilworth Aquatic Gardens, and the Benning Road Power Plant. "Southeast" (SE or S.E.) is located south of East Capitol Street and east of South Capitol Street. It has a rich cultural history, including the historic Capitol Hill and Anacostia neighborhoods, the Navy Yard, the Marine Barracks, the Anacostia River waterfront, historic Eastern Market, the remains of several Civil War-era forts, historic St. Elizabeths Hospital, RFK Stadium, Nationals Park, and the Congressional Cemetery. The quadrant is divided by the Anacostia River, with the portion that is west of the river sometimes referred to as "Near Southeast" and the portion east of the river is known as "River East". Many people falsely call the entire eastern portion of the quadrant Anacostia, although the name refers only to a small area along Martin Luther King Jr. Boulevard. "Southwest" (SW or S.W.) is located south of the National Mall and west of South Capitol Street and is the smallest quadrant of the city. 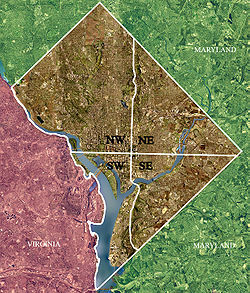 Although roughly half of the quadrant is located south of the Anacostia River in Anacostia, references to "Southwest" generally allude to the area near downtown, within about a mile of the Capitol, much of which was demolished and redeveloped in the 1960s with modern Federal office and apartment buildings. Fort McNair and the National War College are also there. The section south of the River, except for the Bellevue neighborhood, is almost entirely devoted to Joint Base Anacostia-Bolling, the U.S. Naval Research Laboratory, and the Blue Plains Advanced Wastewater Treatment Plant. Wikimedia Commons has media related to Quadrants of Washington, D.C..
^ Adam Froehlig (March 18, 2011). "How much land is in each quadrant?". Greater Greater Washington. Retrieved November 27, 2016. This page was last edited on 26 February 2019, at 05:06 (UTC).